Japan's Venus climate orbiter Akatsuki failed to enter orbit in December 2010 when a clogged valve caused catastrophic damage to its main engine. Since then, JAXA's engineers and navigators have determined that although the main engine is a total loss, there is the possibility of achieving Venus orbit on a future encounter, using only the attitude control rockets. They reduced their mass as much as possible by venting the oxidizer that would have been used in the main engine, and have begun a series of deep-space maneuvers to slowly nudge the orbit to one that could enable Akatsuki to achieve Venus orbit in the future. The closest flyby of Venus will take place in November 2015, and as of last year, JAXA planned to use the attitude control rockets to enter orbit then. However, a new report indicates that the team prefers the next closest opportunity in December June 2016. They prefer it because the geometry of that encounter allows Akatsuki to attain an elliptical orbit from which they can recover some science, doing cloud observations, while the orbit achievable from the 2015 encounter would be much less favorable for science. This assumes that the spacecraft remains healthy. 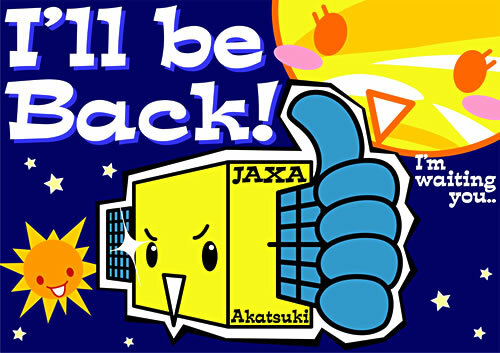 If Akatsuki's systems have deteriorated markedly before the 2015 encounter, then JAXA will consider trying for the earlier opportunity. This news appeared in the Yomiuri Shimbun newspaper, and unmannedspaceflight.com user "pandaneko" translated its main points here. Project Manager Nakamura: Even if the valve completely clogged, current pressure would able to push the propellant well. PM. Nakamura: I'm'afraid it's CCD that deteriorates the fastest in all cameras. It's gotta stand the radiation WITH GUTS!